FACETS is a group exhibition by five artists who call their collective Cerebral V. Consisting of Christine Das, Jasmine Kok, Lisa Foo, Poojitha Menon, and Yante Ismail, Cerebral V considers itself a collective of “thinking artists”. The exhibition begins its run from August 17 and continues until August 23, 2015 and will be held at White Box, [email protected], Solaris Dutamas, Kuala Lumpur. An official opening reception for FACETS is scheduled for 7:30pm on Friday, August 21. Gracing the opening reception shall be Datuk Ir. Rosaline Ganendra, Executive Director of MinConsult Sdn Bhd, our guest of honor for the evening. Datuk Rose, as she is frequently referred, is recognized as one of Malaysia’s prominent corporate figures. She has led the construction implementation of several iconic projects including the prestigious KLCC Convention and Exhibition Centre. In addition, she is a member of numerous professional engineering bodies in Malaysia and abroad. Datuk Rose is also an avid art collector and enthusiast, and maintains strong views on the advancement and empowerment of women. In a nutshell, this exhibition is about the many-faceted concerns, ideas and issues we are confronted with on a daily basis as human beings. 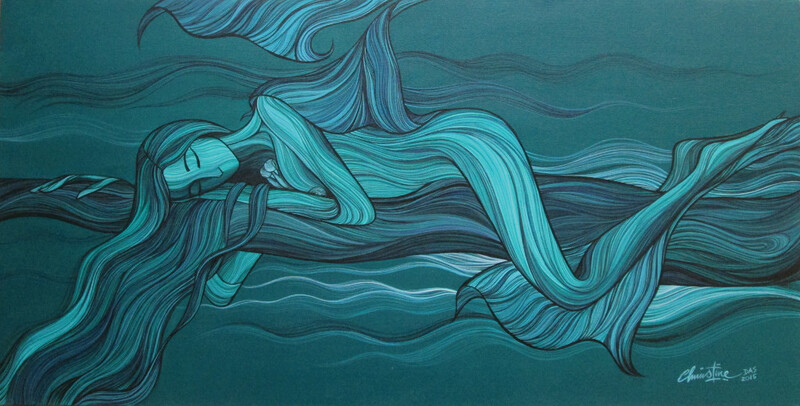 Many art enthusiasts may know Christine Das best for her artworks that glorify the beauty of nature, both fauna and flora, something the artist sees as an affirmation for the existence of the divine. 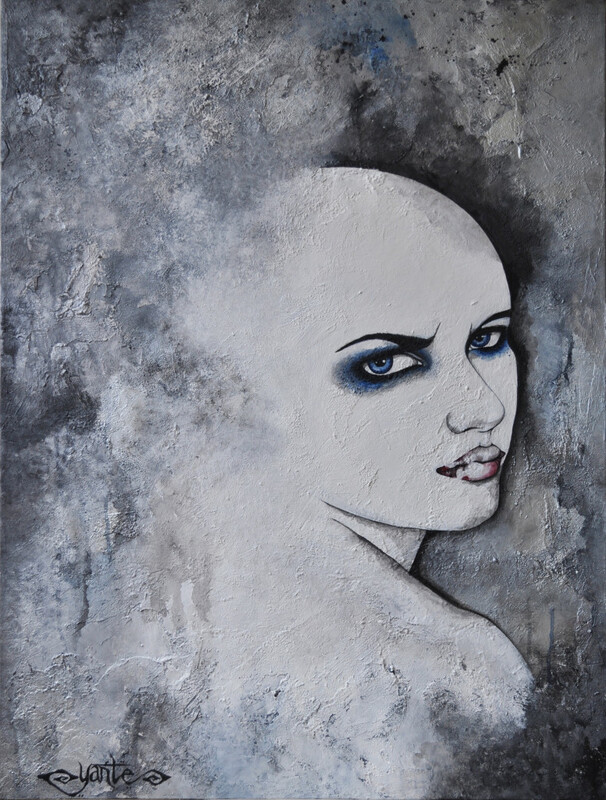 While elements of what has made Christine’s artwork distinctive remain, FACETS sees her embark on a journey of self-discovery, articulated through the Allure series of paintings. 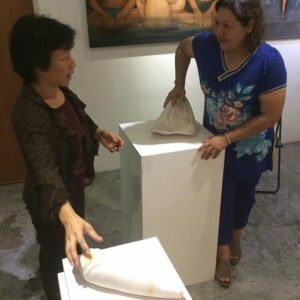 Since 2000, Jasmine Kok’s 2D and 3D art has revolved around the concepts of pain and human sensuality, articulated through her well-known corset-related works entitled Sensuality. 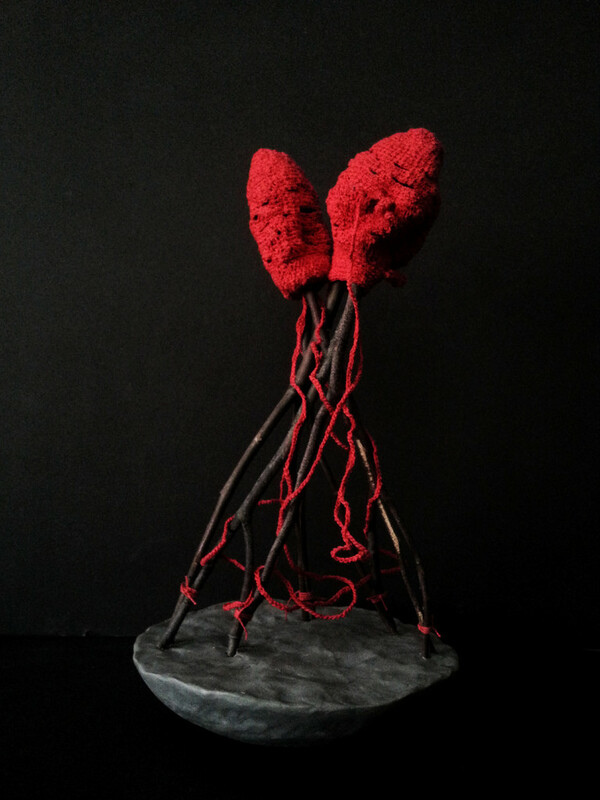 Drawn from personal experience, Jasmine’s work delves into the idea of how pain is endured to project physical manifestations of vanity, and how, in the process, pain gets transformed into something else. Site-specific installation art pieces are what artist Lisa Foo is known for. Walk In The Park, which she created for Art In The Park last year, is perhaps one of her most important works to-date. Constructed from mostly leaves and twigs from Perdana Botanical Gardens where the exhibition was held, the audience-interactive marionette was cited to be a crowd favorite, and the event was an important showcase for promoting public art, the first ever in the capital city’s oldest botanical gardens. Most recent of her installations was Wind Dancers, commissioned for the Medini Live! music, film and arts event held at Mall of Medini in Nusajaya, Johor. 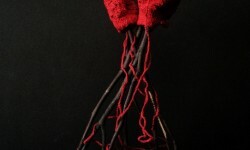 Conceptually, Lisa’s installation art explores the ideas of impermanence and environmental sustainability through material reuse. The site-specific installation planned for FACETS is something we cannot as yet reveal, but one thing we can mention is that it will be impactful. Although her work features children, the semi-realist works of Poojitha Menon delve into a myriad of issues, belying their visual presentation. 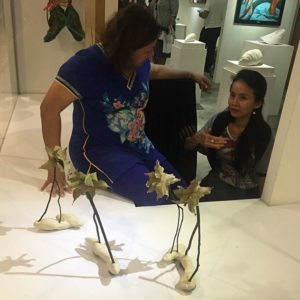 FACETS sees the debut of a new style of art the artist has recently embarked on, bound to surprise art enthusiasts already familiar with her previous repertoire of abstracts, batik and glass art. Last but certainly not least is Yante Ismail, whose art is, on the surface, visual articulations of her strong feminist views. Certainly there are many concerns and issues that impact primarily women, and many more that impact women more than men. But feminism is important because although the direct impact of concerns addressed are on women, they ultimately have an effect on all humankind. If we objectively look at the various facets of the concerns, ideas and issues presented by Cerebral V, what they articulate eventually are concerns applicable to female and male alike. 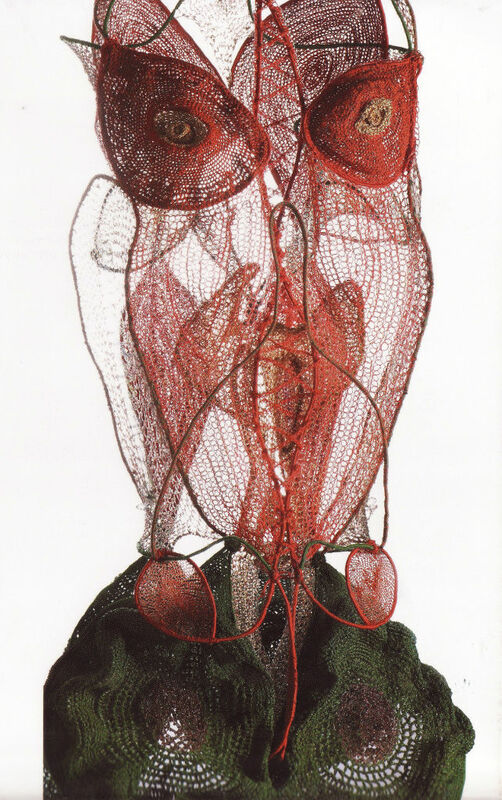 It may require us to decouple ourselves from the socially instilled filters that cause us to view issues along the lines of gender, but given the latitude of examination and introspection, it is indeed possible to realize the universality of what these five artists are conveying. That, plus having a level of objectivity that may, for some of us, require a little additional effort. The following is an excerpt from an essay entitled “Multiplicity of Facets to a Plethora of Concerns“, written exclusively for FACETS. The full version of the essay has been included in the exhibition catalog. 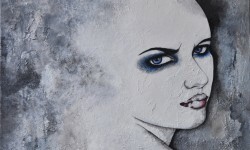 Just as a single gemstone has multiple facets, Cerebral V utilizes a single platform to express a multiplicity of concerns, some unique to specific artists, some shared between two or more. 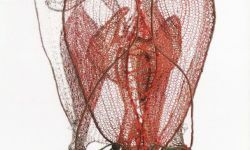 Each artist’s body of work has the strength to stand alone, and yet the five have chosen to join forces, presenting a kaleidoscope of concerns for the audience to contemplate, while admiring the visual splendor of their artworks. 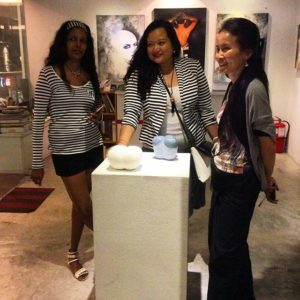 The artists participating in the exhibition, Christine Das, Jasmine Kok, Lisa Foo, Poojitha Menon, and Yante Ismail, are themselves diverse individuals. It is natural, therefore, to expect a plethora of concerns to be addressed. Even when what is discussed by more than one of them broach the same general topic, the approach and focus are different, offering many facets for our consideration. As an example, one aspect of our lives often talked about, but ironically also often take for granted, is the environment. Nature and the environment are often thought of synonymously, but the former in fact is a subset of the bigger latter. For the sake of not complicating matters, however, “the environment” we refer to here encompasses both the natural and manufactured. 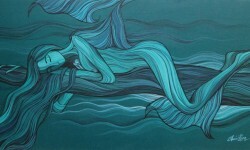 But “the environment” is a very wide topic with many facets, any one of which could become a specific focus. 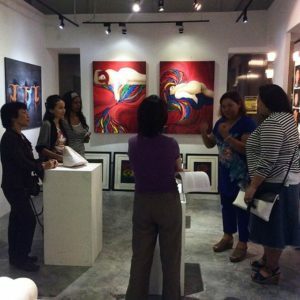 A preview of the artworks to be exhibited is currently being held at Artemis Art, between 8 and 16 August. We had a special preview session between four of the participating artists and our guest of honor Datuk Ir. Rosaline Ganendra, on the evening of Saturday, 8 August. The following is a small selection of the artworks that you will be able to view during the exhibition, which starts on Monday 17 August, 2015 at White Box, [email protected], Kuala Lumpur.